Trenchless Technology has seen a tremendous progress over the last 20years, not only in this country but in many much less developed countries were urbanization is more acute that in our spacious land. This is a multi-disciplinary industry and we have followed certain sectors with more interest than others. A main area of interest is the various forms of pipe jacking: auger boring, microtunneling with non-man-entry machines, mini-tunneling with slurry shield or Earth Pressure Balance (EPB) shield. Aside from boring a clean hole on target without undermining the ground, the second concern is controlling the friction forces along the jacked pipe not to run short of jacking capacity before the end of the drive. Our experience with mineral muds and polymer slurries has helped many contractors staying out of trouble or getting out of trouble. We formulate lubricating slurries on a case by case basis, generally combining a clay with a polymer and chemical additives according to soil, ground water and type of pipe used. 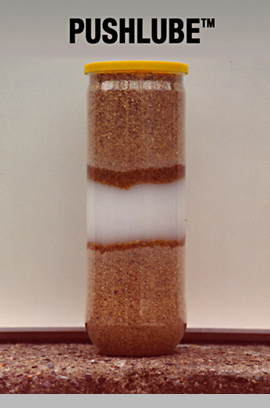 WONDER MUD® and bentonite is the basic formulation for granular soils. The primary criterion is as low a filtrate loss possible to confine the slurry within the annulus. In swelling shale, a concentrated polymer cream like PUSHLUBE will prevent the shale from absorbing water, hence from swelling. The same PUSHLUBE has been used successfully in relining work of old gas lines with swaged HDPE pipe. When the ground is very coarse and loose gravels may bridge and bind and eventually damage the pipes at a joint, especially clay or mortar resin types, a more pasty lubricant is recommended and GEOGREASE formulations may be used. Depending on the drive lengths, larger diameter lubrication plumbing may be in order to limit internal pumping pressures. When engineers contemplate shallow drives and consider the potential for secondary settlements as a result of the delayed decompression of the annulus, they specify a post drive grouting phase which is typically ineffective and expensive. As a compromise, we have developed a low filtrate loss lubricating slurry that is a highly retarded self-hardening slurry that fills the annulus and ultimately sets into a solid of sufficient strength to match the surrounding ground. SLOWGROUT® has been accepted by Owners as an enhanced quality assurance benefit. In many instances, the jacked pipe is only a protective casing for the product pipe or duct bank. The space between the two must be filled with a volumetrically stable, low-hydration-heat grout. Cellular concrete or more specifically foam grout is an option but with some limitations regarding placement length, diameter limitation and cost. A successful solution for self-performing contractors is to flood the annular space with our IMPERMIX® self-hardening slurry through bulkheads at each end of the drive with risers to the surface. The mixer on the surface is the only equipment required, the mixer centrifugal pump dispensing the backfill slurry in the line, from the lower end. Typically, a 2,000 LF drive is not a length limitation, this covers almost all jacked pipe drives. Given IMPERMIX's long setting time, the work can be carried out over a number of days, without or with interruptions. The cost per CY in place is a fraction of any other method. The end product is a durable firm non-shrink, chemically stable, homogenous lightweight grout encasement. In the electric power transmission business, the amount of power that can be transmitted through an underground cable varies with the ability of the heat generated according to Joule's law to dissipate into the ground. A factor called thermal resistivity defines the characteristics of a solid to transfer radiant heat energy. The higher the material's density, the lower the thermal resistivity coefficient. Formulating a highly sanded grout capable of being placed perfectly in a fairly small annular space over a very long distance without detrimental hydration heat susceptible of damaging the plastic ducts was the challenge. Eventually, we formulated a 130 pcf grout (16% moisture) showing a thermal resistivity of 53 C-cm/watt fully saturated and 92 C-cm/sec in near dry conditions, which are exceptionally good numbers while the placement is rendered easy by very long setting times, good plasticity and no measurable heat of hydration. Although the project for which this in house research was cancelled, a new product with a good value is now available to the power-transmission Industry. Welcome to THERMGROUT. A similar application for THERMGROUT is the backfilling of loops in geothermal wells, a most energy efficient way of heating and cooling homes and small commercial buildings.